Shellfish can be quite pricey so realistically, you probably won't be tucking into too many lobster dinners while you're a student. However, you might well try your hand at a prawn curry or some steamed mussels or maybe you'll fancy splashing out for a romantic home-cooked meal if you're feeling a bit decadent one weekend! Discard any mussels that don't close when given a sharp tap. These are dead, which means they're not fresh - throw them away. Scrub the mussels well before you cook them; pull off the 'beards'. As you'll probably be eating the sauce that they're cooked in, you want to make sure all debris has been discarded. 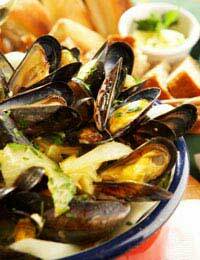 Discard any mussels that don't open during cooking. This is the classic mussel recipe that's really easy to prepare. This amount will serve 2 people. Scrub 900g of mussels, discarding any that won't close when tapped. Fry 1 finely chopped shallot and 1 finely chopped garlic clove in a little butter in the biggest pan you have. Add a couple of bay leaves and a sprig of thyme. Tip in the mussels and 50ml decent white wine. Cover the pan and let the mussels steam for about 5 minutes. Shake the pan every minute or so to coat the mussels in the liquid. Take the pan off the heat and pour in 50ml of double cream and a handful of finely chopped parsley. That's it! You can buy prawns frozen or fresh, raw or cooked. The bags of frozen prawns are generally cooked - you can tell this, as they'll be pink in colour. Raw prawns are a blue-grey colour and you'll have to go to the fish counter or your fishmonger for these. You can also buy prawns peeled or unpeeled. If you haven't cooked prawns before, it's probably best to go for frozen, cooked prawns. The bigger varieties, such as tiger prawns, have more flavour but they're more expensive. These are great for curries and stir-fries and they're really easy to prepare. Take them from the freezer about 30 minutes before you need them. Put them in a colander and rinse well under cold, running water, until they defrost. You can then either use them immediately or pop them in the fridge until required. Only take out what you need from the freezer, as they shouldn't be re-frozen once defrosted. Once defrosted, prawns will only require a brief cooking time - too long and they get tough and chewy. Unpeeled prawns are great for a special dinner party starter and, depending on size, you'll probably need about 3-4 per person. You should always supply a finger bowl so that guests can rinse their fingers afterwards - it's mucky work! They also work really well in dishes such as paella as they look really attractive. There are so many other varieties of shellfish but mussels and prawns are probably the two that you're most likely to attempt cooking yourself. Scallops are delicious and need only the briefest searing in the pan on either side to cook. You can replace them in their shells to serve, as they're really pretty. Lobster really is a special occasion dish and you should only cook this if you're very confident in the kitchen, as you need to kill it before cooking. It can be quite fiddly to split the shell in half and, as it's expensive, you wouldn't want to mess up and ruin the dish. However, if you're a bit of gourmand then it's a really impressive dish to cook for a romantic meal!